LOL! I use that line all the time! Congrats on your fabric conquest. I am guessing it will be made into a lovely Heidi dress! you get madder when it wears out/rips/gets spilled on.I have just started making clothes (half-circle skirts so far), but I think I will feel opposite—since I know Ill be able to replace an item with something I like as well, I feel more willing to let go. But that may be a side effect of having hoarding tendencies. Plus I havent made anything very complicated yet, so fairly small investments.Have fun with the fabric! I think youve articulated my frustration with searching for fabric on ebay — Ive pretty much given up on it. Shoot. I just turned green. OMG. I need that fabric. This is why I love Erin. She uses the same quotes I do and loves the same funky prints I do. You can never wrong with type as a design! One of my favorite George fabrics ever is a Michael Miller with etc and asterisks in pairs all marching along is perfect type face rows. In black and white. Love it. I love this George, too. Wow! Just fell in love with your fabric!! I try to find it ( to share your luck!!) but…no! 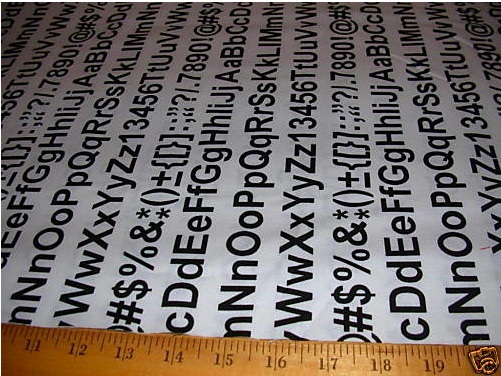 Instead, I,ve found a FABULOUS eyechart fabric! Om an optician and i teach how to do glasses in collèege…Wow! My students will be crazy when ill show up with my new eyechart skirt!Yahou! Im curious! Have you ever thought of just printing your own at Spoonflower.com? You could even use the font of your choice! hahahahahahahaha! I feel your excitement and angst… Excitement – much better indeed – congrats on the find! Ohhhh, I love this – I teach Typography and the font is HELVETICA!